Indian cents were designed by United States Mint Chief Engraver James B. Longacre and released in 1859 as a replacement for the Flying Eagle motif, which debuted in 1856 and became the nation?s first small cent. Interestingly, the Indian cent name is a misnomer, as the female figure on the coin?s obverse is not a Native American but rather a Caucasian figure of Miss Liberty wearing a feathered headdress meant to depict, if inaccurately, a style of head adornment similar to those worn by some native peoples. The Indian Head ?penny? was minted until 1909, spanning some 50 years and becoming what was then one of the America?s longest-running coin series, along with the contemporary Liberty Seated motif that ran on most of the nation?s silver coins from the late 1830s through early 1890s. During that time, the Indian Head cent series spawned a plethora of semi-keys, a least one key, and many varieties. The 1859 Indian cent is a one-year-only type, serving as the only issue without a shield depicted on the reverse. The wreath was modified and a shield added to the reverse in 1860, and in 1864 came a variety of changes to the series. In 1864, the cent?s composition was changed from 88% copper, 12% nickel to 95% copper, 5% tin or zinc. 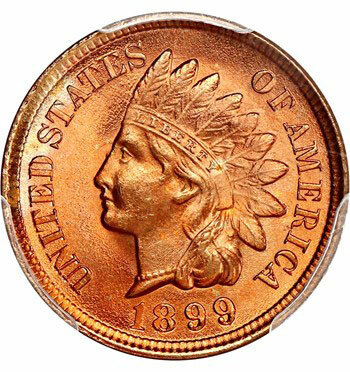 There were two compositions used that year, with some 1864 cents made with the copper-nickel composition and others composed of bronze. Furthermore, some 1864 bronze Indian cents bear an ?L? (Longacre?s initial) on a ribbon near the bottom of Miss Liberty?s headdress. The coin?s design and composition remained virtually unchanged after 1864. However, many of the 1860s and 1870s issues are scarce in all grades, with the 1877 Indian cent the serving as the most popular key date with a mintage of only 852,500 pieces. However, the 1877 cent is not the lowest-mintage Indian cent. That claim goes to the 1909-S Indian cent, which has a mintage of just 309,000 pieces and is only the second mintmarked issue in the series. The 1908-S Indian cent, which was the first mintmarked cent, is the third-scarcest regular-issue in the series with a mintage of 1,115,000.